Crooked teeth are not only a cosmetic concern, they can also be a dental health issue that needs to be addressed to avoid problems down the road. Crooked teeth can make it difficult to brush and floss effectively, raising the risk for tooth decay and tooth cavities. They may also cause an imbalance in the bite that can lead to a bite disorder such as TMJ. 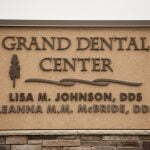 Grand Dental Center offers a variety of treatment options when it comes to addressing the problems associated with crooked teeth. Your dentist will perform a thorough evaluation and recommend the best option for your dental health and cosmetic goals. Many adults wish to straighten their teeth but want to do so without metal braces. Braces are a long and sometimes painful process. Besides being uncomfortable, braces are sometimes seen as juvenile, and many adults don’t want to wear them. There are options, however, to straighten your teeth by other means. Porcelain Veneers: Porcelain Veneers can be used to correct minor problems including gaps between teeth, crooked teeth or uneven teeth. Cosmetic Tooth Bonding: Cosmetic bonding is a quick and easy way to fix minor imperfections in the teeth, including crooked teeth. Dental Crowns: A dental crown covers the entire tooth and can be used to close spaces between teeth, lengthen teeth, and achieve symmetry. Grand Dental Center is an Invisalign provider and frequently recommends this option for patients who need mild to moderate orthodontic treatment. Invisalign can straighten teeth and fix a variety of other dental problems through a series of custom made clear aligners that gently reposition the teeth. With Invisalign, no one has to know you are wearing braces and treatment is typically completed in about a year.